POETIC JUSTICE: Keith Baker, Allison Rae Baker and Chad Yarish (L-R) lift the Rep's final play to great heights. The tale of Cyrano de Bergerac and his passion for the beautiful, unattainable Roxane is among the best-known—and best-loved—love stories in the world. The chronicle of the 17th-century poet with the large nose and even larger heart has been adapted countless times to stage, screen and television. 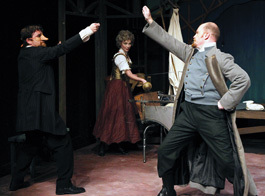 In Edmond Rostand's original 1897 play, there are roles for 75 actors, with several grand battle scenes and plenty of scenery. In Cyrano, by Jo Roets (running through Feb. 20 at the Sonoma County Repertory Theater, the final production for the imminently closing company), there are exactly three actors and almost no scenery. Many contemporary attempts at shrinking down epics have consequentially produced shows that resemble silly Saturday Night Live skits more than actual plays, with comic irony and quirky cleverness replacing actual drama, heart and human feeling. The same might easily have been said about the Rep's new staging of Roets' Cyrano were it not for the exceptional emotional commitment of its cast and the superior sensitivity of director Jennifer King. As Cyrano, Keith Baker digs deep, grounding his performance in solid believability, and we know from his first line that this love-struck warrior will break our hearts by the end of the show. Playing a number of supporting roles, Allison Baker is entertainingly cartoonish in comic supporting parts, but then, as Roxane, she drops the silliness to give us a real person, her lovingly detailed performance spanning Roxane's evolution from the self-involved, slightly vain girl she is at the beginning to the mature and (coming a little too late) emotionally aware woman she becomes. Chad Yarish, who's made a name for himself in large, oversized comic roles, dials it back nicely here, doubling as Roxane's tongue-tied intended Christian and also as Count de Guiche, who plans to marry Roxane himself. Though I'd liked to have seen a bit more menace in his de Guiche (a character with a fairly juicy story arc himself), Yarish plays Christian with the right amount of clueless and sweet single-mindedness. The story at its heart is simple enough: Cyrano loves Roxane, but is certain she could never love someone who is not handsome, and since he will not allow himself to tell her of his feelings, instead lends his words of love to Christian, who, so armed, woos Roxane with poetry he is too simple to devise on his own. When stripped of the battles, political intrigue and numerous plot twists, the play becomes all the more dependent on a sense of electric connection between Cyrano and Roxane. Baker and Baker (they married last summer) deliver plenty of electricity. Essentially a beauty-and-the-beast story but with a much more complex resolution, Cyrano succeeds or fails based on how much the audience hopes its two separated lovers can somehow be together, and how much we hurt when it turns out to be impossible. In this deeply felt condensation of the classic, the text may be brief and focused, but the emotional power of the story remains beautifully, and satisfyingly, enormous. 'Cyrano' runs Friday-Sunday through Feb. 20 at the Sonoma County Repertory Theater. Friday-Saturday at 8pm; 2pm matinees on select Sundays, Feb. 13 and 20. 104 N. Main St. in Sebastopol. $20-$25. 707.823.0177.